Florida continued to be a hot spot for the affluent in 2018. 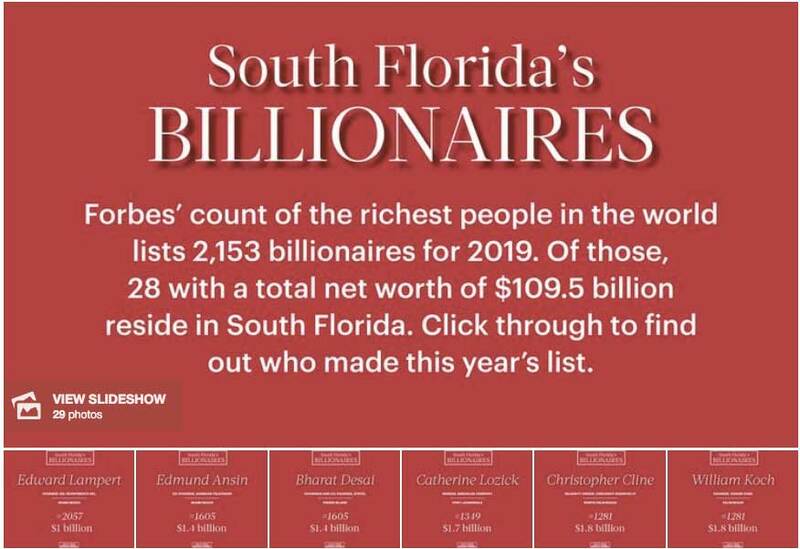 The Sunshine State was home to 52 billionaires last year, with more than half calling South Florida home, according to Forbes’ annual ranking of the world’s billionaires. The number of Florida billionaires increased from 51 in 2017. But globally, there was a decrease – Forbes reports there were 2,153 billionaires in 2018, down from 2,208 the previous year. South Florida’s wealthiest resident was ranked No. 63 by Forbes, with a net worth of $17.1 billion. Thirteen of the tri-county area’s 28 billionaires resided in either Palm Beach or North Palm Beach, with the rest dispersed through Boca Raton, Delray Beach, Fort Lauderdale, Miami and Miami Beach. Amazon founder Jeff Bezos, with a net worth of $131 billion was ranked the richest person on the planet for the second consecutive year. Microsoft founder Bill Gates, with a $96.5 billion fortune, followed, while Berkshire Hathaway chairman and CEO Warren Buffet came in at No. 3, with a net worth of $82.5 billion. Click on the slideshow to see the Forbes ranking of South Florida billionaires.